The power of the Forglar Swamp lies in the wisdom of the ancient Boghoppers and Firk that have spent centuries protecting and nurturing their fertile waters. The main attributes of Forglar Swamp is their manipulation of water, the strength of their healers and their ability to extract additional Nora from the land. 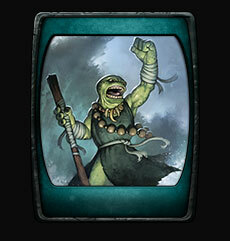 If you enjoy small, mobile units and elemental based spell-casting, Forglar may be the faction for you. 15/15: You recover 3 Nora at the start of each turn. Full Faction: You recover 6 Nora at the start of each turn.